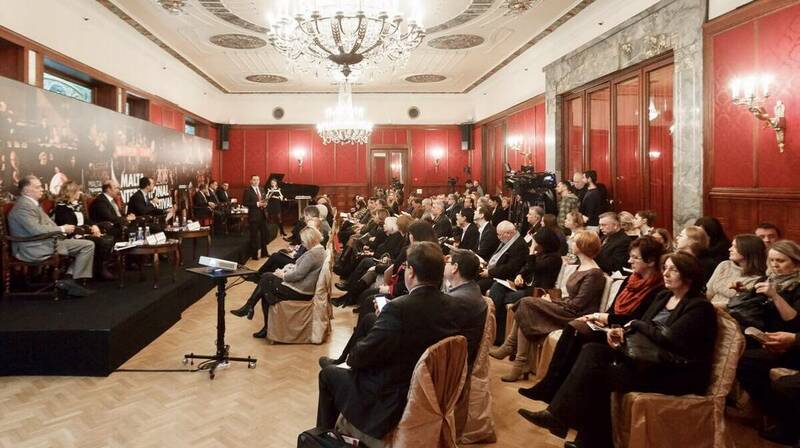 During a press conference held last week at the Metropole Hotel in Moscow, Valletta 2018 Foundation Chairman Jason Micallef, together with Malta Philharmonic Orchestra Chairman Sigmund Mifsud and a representative of the Malta Tourism Authority Lionel Gerada, in the presence of the President of the European Foundation for the Support of Culture Konstantin Ishkhanov, announced that as part of the great collaboration between the European Foundation for the Support of Culture, this year, the Malta International Music Festival will include no less than 16 concerts of classical music, workshops, and a competition for pianists with a top prize of €100,000. The Maltese contingent was in Moscow on an invitation of the President of the European Foundation for the Support of Culture, Konstantin Ishkhanov. This Foundation also has an office in Malta from where it started to operate three years ago. Among the musicians of international fame who will be performing in Valletta is Grammy Award-winning Israeli violinist Maxim Vengerov, the internationally-acclaimed Russian pianist Grigory Sokolov and American violist David Carpenter, the gold medal winner of the Tchaikovsky competition cellist Narek Hakhnazaryan, violinist Ray Chen, pianist Denis Kozhukhin and the Khachaturyan Trio. The concerts will be held at the Mediteranean Conference Centre, Pjazza San Ġorġ, as well as at Robert Samut in Floriana, and will take place from the 15th April until the 1st May. The Pjazza San Ġorġ concert will include a performance by the Armenian State Symphony Orchestra and the Malta Philharmonic Orchestra, on the 22nd April at 8pm. Valletta 2018 Chairman Jason Micallef said this collaboration builds on the calendar of events with a European and international dimension. He emphasised this is a great opportunity for Maltese and Gozitans to watch some of the world’s greatest musicians and directors in Valletta. It is menahwile an opportunity for Maltese musicians to exercise their talents in such a unique and prestigous festival. Malta Philharmonic Orchestra Chairman Sigmund Mifsud observed that a festival of this scale helped give an identity to Malta’s classical music scene, not least by promoting Maltese works. “We are proud to see our musicians performing as soloists in such a prestigious festival, on the same stage which will feature some of the world’s greatest artists, including Vengerov, Sokolov and many others,” Mr Mifsud remarked. Mr Gerada said, “What strikes me most about the ongoing festivities in Malta is the new dimension given to our capital city; a city becoming a modern hub, seeing our islands host massive music festivals such as the Isle of MTV, the Malta International Baroque Festival, Lost and Found and Unite With Tomorrowland… This year we have four new festivals to add to last year’s calendar with The Malta International Music Festival being one of them”. “Our efforts towards the regeneration of our music scene facilitate our job when we extend invitations for different nations to visit our islands,” he added. For further details visit www.maltafest.eu.